Last Saturday, I ran/rode/raced/did(?) 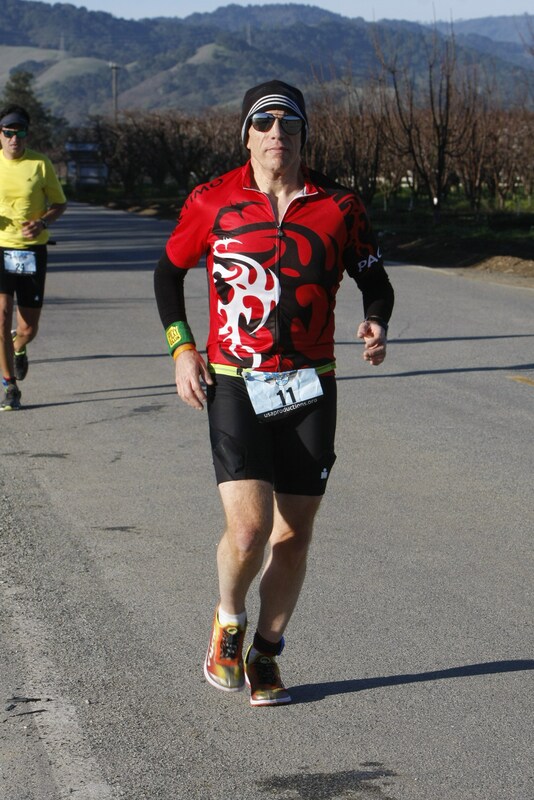 the 2014 edition of USA Productions’ South Bay Duathlon in Morgan Hill. 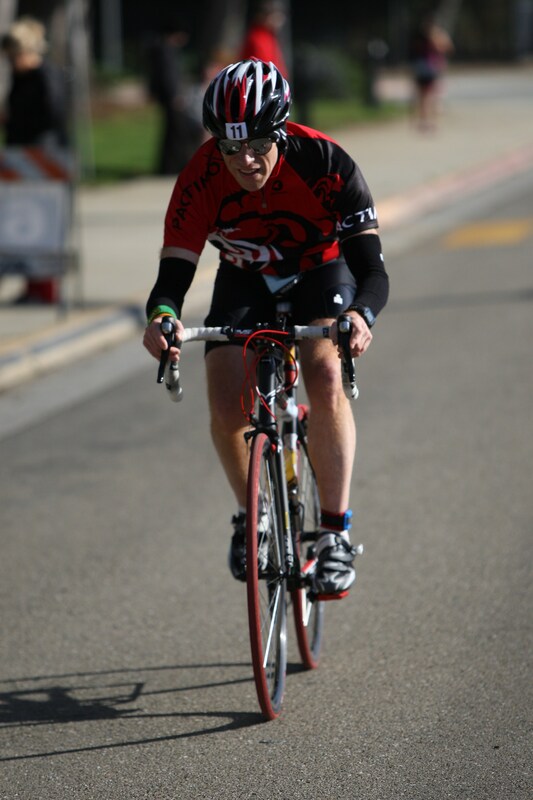 This was my first multisport event and, from the “go big or go home” camp, I went for the International distance (they offered a sprint distance as well.) 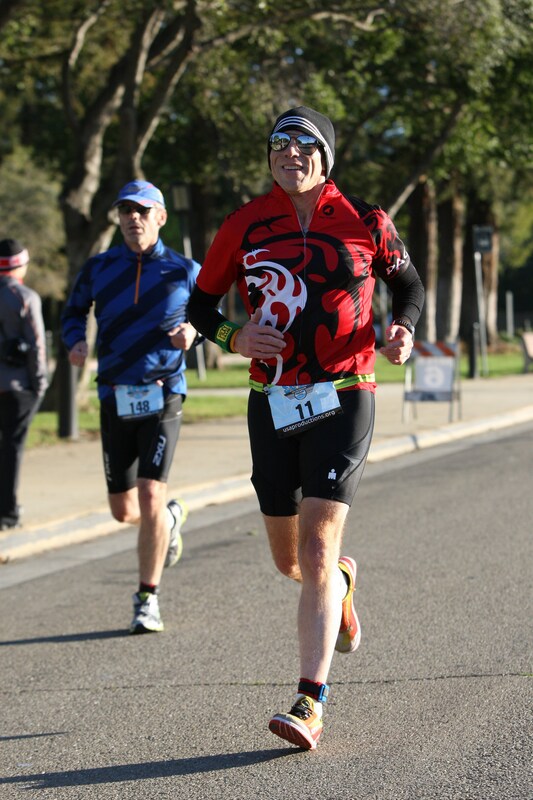 This event is the only duathlon that USAP offers and is billed as a “great opportunity to prepare for the upcoming triathlon season, the remainder of the duathlon season, or just enjoy an endurance event in the bay area.” From my perspective, this was a dipping of the toe into multisport…and I’m hooked. For sure on duathlons…and most likely on triathlons too – I just need to come to grips/train for the swim. I do wish USAP would stage more duathlons or offer them as an option for their triathlons as other tri events often do. Finishers. This was a small even, which suited me just fine! International: 113. Sprint: 149. There were also relay teams that did the duathlon as well – International: 2. Sprint: 2. Weather. The weather was forecast to be excellent for a race. At start time, it was about 46 degrees with no wind. At the finish, it was about 61 without any wind. Again, weather was awesome! Course. The run and bike courses were both flat loops on paved roads. 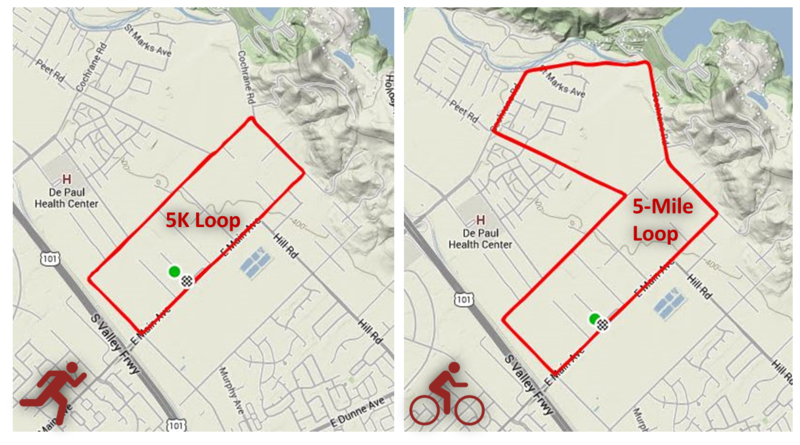 The run was a 3.1-mile, rectangular loop and the bike was a 5-mile loop that covered most of the run course, plus a nice ride along the foothills. I said both courses were flat, but the bike did have a .25-mile “roller” at mile 3.25 of each loop that made the ride portion interesting and gave you a nice push to speed up for the backside of each loop. Management/Support. Course management, support, and volunteers were excellent! The courses were clearly marked and had signage and cones at the turns where traffic could become a problem (the local roads were not closed for the event.) The aid stations were spaced great and the volunteers were awesome! At transition, there were course officials giving directions to make sure things went off without a hitch. Post-Race. The post race area was great – all in one: the finish line fed right into the food/SWAG/awards area. They had a great selection of post-race food, including burritos (though I didn’t partake of one.) There were quite a few people just hanging out after the finish of the International distance and the faster finishers from the Sprint Du. Medal/Shirt. Each finisher received a medal and a non-technical shirt (which was nice for a change.) Both displayed the logo for the event. As with my first marathon and 50K, this is a long and detailed report, mainly to capture my thoughts and other stuff about the race for myself. Read on or skim! So, SBDU was my first foray into the world of multisport. The day I would link two sports I have come to love and enjoy: running and cycling. One I’ve become pretty confident at (running) and the other I’d still consider myself a dabbler (cycling.) Honestly, I was pretty confident about doing well in each of the separate sports (more so with running than biking) – it was the transitions that I was most nervous about. I had practiced transitions, but not in the space or layout that would be at the race – there is quite a bit of difference between my driveway/garage and the properly distanced/laid out transition area at a race. First time or not, I did set a goal for the day, based on my overall training and two, dry-run 10K/40K/5K sessions that I did on two Sundays. More on the goal later. The transition area opened up at 0600, so I got there at about 0550 to make sure I had time to set up, orient, use the porta-potty, warm up, and then calm down before the start time – I wasn’t leaving anything to chance. As I parked, there were people starting to arrive, so I did the porta-potty thing first – love being “first user”! After that, I got my kit and went to the transition area. I thought transition location was supposed to be based on bib number, but when I checked in, they said people could set up wherever. I decided to grab an end-of-row space in the middle of the area – thinking about having to run out and in wearing my bike shoes (read: less opportunity to slip.) I set my stuff up pretty quickly, remembering to keep things minimal and also place some visuals to make sure I could easily locate my space: orange backpack and purple towel where I could see them coming in. I didn’t want to have to count racks coming into transition. After setting up, I went for a warm-up run up the course and then back into the event area scoping out the entry to transition from the road, the exit from transition, the start area, and the finish line. I was basically killing time and trying to calm my nerves – most of the people setting up for the international distance looked pretty serious…at least in the eyes of this newbie. When I got back to the transition area, I hit the porta-potty again, did my final set-up with fuel, and then chatted with a few people in the transition area. I must have looked OCDish as I was repeatedly checking my transition set-up, on-board fuel placement, and kit so much – nervous energy! I headed to the start area at about 0650 and hung out. The international distance started first, with the first of four waves starting at 0700 and my wave (#4) starting at 0712. The Sprint distance didn’t start until 0930, so most of those people were not even at the event at that point. I watched the first three waves head out then lined up with my fellow “males 40 and over” competitors – a total of 48 of us. As we all lined up, I looked at people’s placement and there were definitely three “sub-waves” in the final wave…I lined up in between the first and second ones, knowing that I planned to try for a Run 1 pace right around 8:00 or just slightly below. My plan was to go easy on the first run, keeping the pace at or just under 8:00/mile. My pacing during the two dry-runs was faster, but I didn’t want to have an awesome Run 1 and sucky rest of the race. “At or just under 8:00”…yeah right. I went out like I was running a 10K only and when the first mile split buzzed on my Garmin, I saw 7:33…I thought, “dial it back, Dennis.” I tried to slow and ended up with a 7:44 for the second mile. The final mile of the 3.1-mile loop is a downhill, so I naturally sped up to a 7:23 pace. For the second loop, I again tried to dial it in as best I could, but ended up with miles one and three being faster than the same segments on the first loop. Coming into T1, I said to myself, “Hopefully I this wasn’t the best part of my race”…having seen the Garmin buzz mile 6 as a 7:16 pace! One funny thing and one total goof happened on Run 1. Funny: At about mile one, I noticed that my race number belt was positioned such that when I wanted to get to my GU packets and salt tabs from my jersey, it would be tough. I decided to adjust on the run and ended up popping off one of the little tabs that secure the number to the belt. I saw it fly off and spin around on the ground and instinctively kept running for about a few yards then decided that it would be disastrous to let the bib flap about during the rest of the race (~33 miles.) I did a quick loop, grabbed the tab, and then picked the pace back up – securing the bib back on the belt! I ended up twisting the belt when I put it back on, but the bib was at least secure. Total Goof: Actually this was a dumb error. One that, as a runner who knows his abilities and needs, should have never happened. Truth is, I am a sweaty runner and have learned that I need electrolytes to avoid cramping in my calves on longer runs or training sessions. Knowing this, I brought my 12 oz. handheld filled with GU Brew for run 1. Before the race, looking around at my fellow runners, I noticed that most were not carrying any hydration – I assumed that they would be relying on the two aid stations that were on the run course for necessary hydration. I caved to peer pressure (place on my by myself!) and left the handheld where it sat in the picture above…and paid for it on the bike. Stupid, dumb, rookie error on my part. “helmet, shoes, shoes, GO!” is what I kept repeating in my head over the final .2 miles of the 10K. I wanted to make sure things went well in the first of two transitions – the aspect that I was unsure and nervous about for the race. Things went pretty good on T1. The only thing that tripped me up was getting my left bike shoe on and then mounting and clipping in at the mount line. Ahead of the race, I pictured myself slipping while running in my bike shoes out of transition and purposely took the run out a bit slower to eliminate that possibility. T1 = all good! After getting clipped in my pedals (FINALLY! ), I headed out for the bike. The result of that total goof/dumb error above manifested itself within the first two miles: a cramp in my left calf. 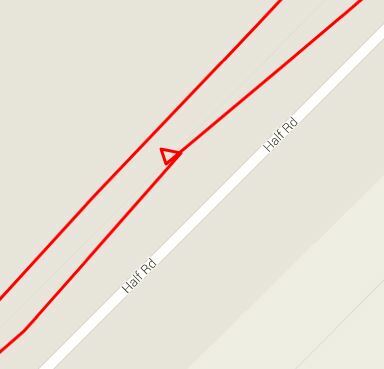 It would nag me for about 15 miles until it finally worked out for the most part. Cramp or not, I kept going;’ easing up when it started to pull too much, but still tying to stick with my pacing plan of about 17 mph. I popped two salt tabs and drank most of my 20 ozs of GU Brew electrolyte drink during that time. I did leave about 2 oz. for the final mile to hydrate up before T2. I am not a strong cyclist, so I did not expect too much from the bike portion. My training rides on much hillier terrain average about 17 mph, so I was at least hopping for something along that pace or better. I ended up with an overall pace of 17.5 mph and believe I could have been faster had I not been nursing the calf cramp for 3/5’s of the bike. As expected, the little .25-mile “roller” at the backside of each loop was the slowest portion of my bike – probably for most as well. Still, I did pretty well on it, even with doing three iterations with my calf cramp. All-in-all, the bike went well. I gritted out a decent pace in spite of the calf cramp and ended up with a faster 40K than both dry-runs sessions. Just as I did for T1, over the final .5 mile of the bike, I kept repeating my transition in my head: “Rack-It, helmet, beanie, shoes, shoes, grab visor, GO!” Things went very smooth – no trips running in with the bike shoes. My shoes straps didn’t give me too much trouble taking them off – my shoes have two Velcro and one clicker-type strap that can be a pain to get out of in a hurry. T2 = excellent! Smilin’ in the home stretch! Over the last mile of the bike, I weighed taking the handheld on run 2 or leaving it – knowing that it was still sitting on my towel in transition. Since I had worked out the calf cramp and the final run was a single loop with two aid stations, I decided to leave the handheld. I also decided to stick with my original pacing plan to maintain as close to a 7:30 pace as possible; but, decided that I would slow up or walk if the calf cramped again. I felt good about that plan and went with it! It’s weird, coming off the bike in my training, I am always faster…I may feel totally slow…but I consistently end up with a faster pace than on run 1. I wasn’t sure this would hold true with the cramping I had on the bike, but I went for it out of T2. I felt good on mile one, ending up with a 7:14 pace; however, I really felt tired on mile two. It was around 60 degrees by then and that could have contributed to that feeling as well…it’s been a while since I’d run in temps that warm. I ended up speed walking through aid station one, again at a point when the course narrowed through a dead end fence that separated two roads, and then again at aid station two. I ended up with an 8:20 pace for mile two – still not bad in the scheme of things. I probably should have flipped the mile one and two paces coming out of T2. Mile three on the loop was flat/slight downhill and, since I was felling good again, I decided to go for it. I went from an 11:00 min pace at mile 1.9 to an average pace of 7:20 for mile three and a final kick pace of 6:49 to the finish. I crossed the finish line (smiling!) , turned in my timing chip, accepted my medal, took the ice-cold bottle of water and chamois that they were handing out, and kept walking to cool down. Overall, I am very, very happy with my whole race – each segment and transition. The goof/dumb error was the only aspect that I would change, of course. I believe the pacing on run 2 would have been different if I had not cramped on the bike. 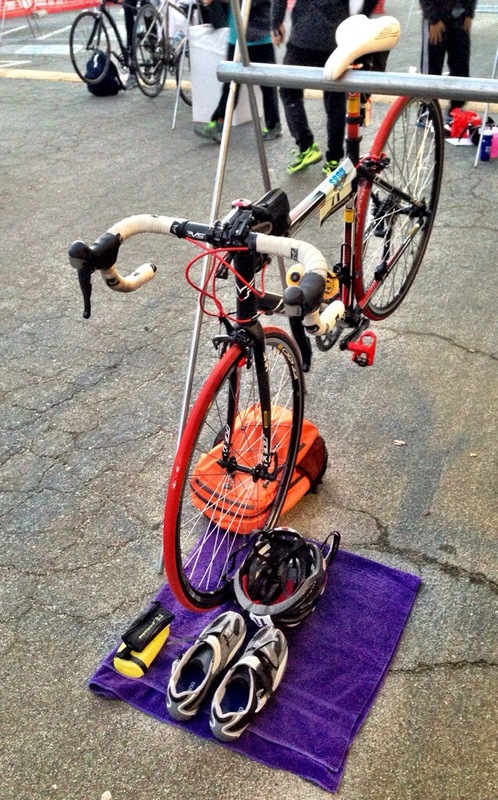 Running in my bike shoes proved to be a non-issue and the transitions went very good for my first multisport. Fueling. Pre-race, carb loading: I modified my normal routine, increasing my calorie intake by an additional 200 each day: 36 hours of >80% carbs and +700 calories above my normal day. Race-day fueling: I ran out of bagels, so I ate two slices of Sheepherders bread with 2T peanut butter at -3 hours, a GU at -45 min, a GU & salt tab at -15 minutes, and GUs(2) and additional salt tabs (3) along the way. I drank 20 oz. electrolytes during the bike portion and took some water/electrolyte from the aid stations during the run segments. Equipment/Kit [head to toe]: Adidas running beanie (R1/bike)/Headsweats visor (R2), cheapo aviator sunglasses (SWAG from Picky Bars! ), Pactimo Ascent bike jersey, Road Runner Sports arm warmers, Picky Bars #TeamGreen wrist band (more SWAG from Picky Bars! ), Road ID (Slim), TYR Ironman Tri Shorts, FuelBelt Gel-Ready Race Number belt, Road Runner Sports Dryroad socks, Altra 3-Sum shoes (R1/R2), Shimano SH-RO87 Road Shoes, 2012 Felt Z85 road bike. Repin’ Picky Bars’ Team Green! Bottom line: I did my first multisport!!! Post-race meal: Did a quick clean up post race and drove to meet my wife and mother-in-law for lunch. Treated myself to a big BBQ cheeseburger & fries! More Multisport events? So, I will admit it – I am hooked. I confess, I spent a portion of my lunch on Monday looking at triathlons in the local area (gulp). That said, I don’t know that I will do any other multisports in 2014 – at least as it stands right now. I have some other running goals that I’ve set (blog post to follow) and don’t think I can work in the proper training for a duathlon – and certainly not for a triathlon. I may re-evaluate in a few months (hehe); but I can definitely see adding multisport races to the mix in 2015 – both duathlon and (gulp) triathlon.